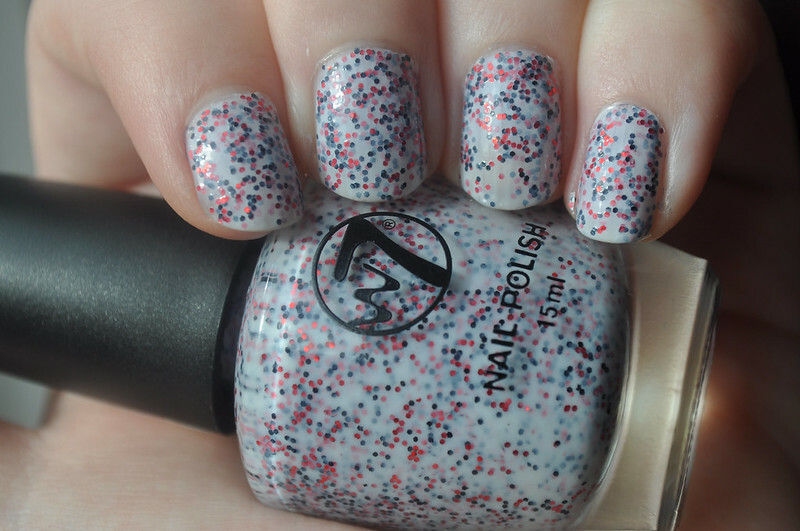 W7's Lava Flow is pretty much an exact copy of the Nails Inc Sprinkles polishes. Although it isn't the same colours it's basically the same style. I have one of the Nails Inc one's, Sweets Way, so I wanted to give the W7 one's a try. I'm hoping to pick up two more Sprinkles when they're in the sale as I just don't think they're worth the £11 price tag. Lava Flow is a sheer white base packed full of red and blue glitter. It isn't your normal type of glitter though, because of the sheer white base it almost makes the glitter look matte. For this NOTD I applied two coats but if you want the glitter completely even and to cover each nail a third coat is probably best. Although you could try adding this to a white base, that way you'd probably be able to get away with only one. This polish completely eats up any top coat you apply so you'll need a couple of coats if you want a glossy smooth finish. I'm not bothered about this so I just applied one. I bought mine from Amazon for £2.95. Do you like these kind of nail polishes? Tried any of the Nails Inc ones? I'm a big fan of nails inc, I think they last really well. I like this glitter, reminds me of those sweets!